Hope and Healing in Urban Education proposes a new movement of healing justice to repair the damage done by the erosion of hope resulting from structural violence in urban communities. Drawing on ethnographic case studies from around the country, this book chronicles how teacher activists employ healing strategies in stressed schools and community organizations, and work to reverse negative impacts on academic achievement and civic engagement, supporting their students to become powerful civic actors. The book argues that healing a community is a form of political action, and emphasizes the need to place healing and hope at the center of our educational and political strategies. At once a bold, revealing, and nuanced look at troubled urban communities as well as the teacher activists and community members working to reverse the damage done by generations of oppression, Hope and Healing in Urban Education examines how social change can be enacted from within to restore a sense of hope to besieged communities and counteract the effects of poverty, violence, and hopelessness. Black Youth Rising is a book that restores hope and possibility to the lives of urban black youth. 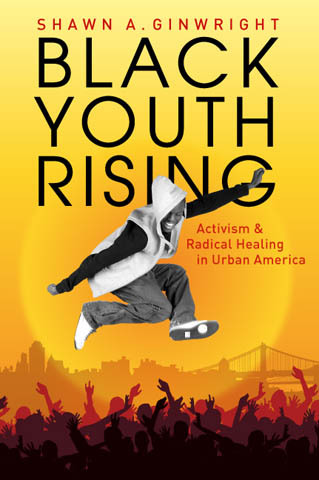 In this pathbreaking account, author Shawn Ginwright details the powerful positive impact that community-based organizations can have in rebuilding the lives of urban black youth, in a process he calls radical healing. Readers can see how caring adults in a community setting are able to create safe spaces for youth to turn away from neighborhood violence and their own traumatic pasts. Together, young people build a refuge within their own community that allows them to turn away from the common dangers of street life and toward building healthy identities and a productive future for themselves and others. Combining a theoretically grounded framework with practical strategies, Black Youth Rising offers a new model for understanding what African American youth need in order to succeed in school and in life. This book is essential reading for educators, social workers, community organizers, after-school coordinators, and all who work with inner-city adolescents. Over the past decade, urban communities have experienced unprecedented social, economic, and political transformation. Globalization and de-industrialization have contributed to the exodus of jobs, produced higher levels of inequality, and consequent, furthered marginalization of the urban poor. Urban youth have been particularly affected by this transformation. The failure of urban school districts and the lack of jobs, health services and effective prevention and intervention programs have placed large numbers of low-income urban youth at risk. In the absence of policies and institutions that respond to the needs of youth, a climate of fear focused particularly on responding to fears of youth crime has also shaped a national consciousness about urban communities and the youth within them. Urban Youth and Community Change brings together work by leading scholars who study urban youth and who have a grounded knowledge of the issues they face. A commitment to social justice and equity is a unifying theme for this volume, and each of the authors examines to varying degrees how such values and commitments can be incorporated into public policy. The goal of this edited volume is to draw on the knowledge and expertise of these scholars from various academic disciplines and to share with policymakers and the general public insights into the impact of punitive/zero tolerance policies on young people's educational experience and well being. These chapters also offer new ideas about how to support youth placed at risk by deteriorating circumstances in urban areas and offers recommendations on how to create more humane and responsive youth policies at the local, state and federal level. * ISBN-13: 9780415952514 * Edition Description: 1ST * Edition Number: 1 * Pub. Date: April 2006 * Publisher: Taylor & Francis, Inc.
What are the limits of Afrocentric reform for African American students whose schools and communities are ravaged by poverty? How can an understanding of poverty improve Afrocentric reform efforts? This probing book turns an analytical lens on an urban high school's attempt to improve academic performance with an Afrocentric curriculum. The author's detailed examination provides a comprehensive look at the limits and possibilities for identity reform in poor urban schools.